To get to the bonus features menu you have to skip past two screens, one to establish what language you want the menus in, and one to select either the subtitles of your choice (wild guess - presumably this would be the same language you wanted the menus in?) or the bonus features. Welcome to Europe. 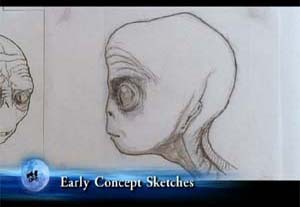 On screen this is called E.T. - The 20th Anniversary Celebration, and is a very solid retrospective documentary prepped by Laurent Bouzereau, some of which had been made available before (on an NTSC laserdisc). There's a lot of on-set footage, including many shots of Spielberg coaxing a performance from his young cast members, and several sequences showing the animatronic puppets being operated. There's plenty of charming footage of the seven-year old Drew Barrymore, goofing around and empathising with the puppet, and some clips from Henry Thomas' audition tape, too. 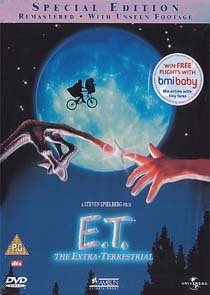 About a quarter of an hour is devoted to the changes Spielberg has made to the film for the 20th Anniversary reissue. There is also some tantalising clips from deleted scenes, including the legendary Harrison Ford cameo. There are also contributions from all the main cast members (the novelty of this soon wears off, since they are also the focus of another bonus feature) and key crew members, including writer Melissa Mathison and producer Kathleen Kennedy. This is one aspect of the Region 2 disc that scores over the Region 1 two-disc set, which cuts the documentary in half (it's apparently available in full on the three-disc version). Anecdotes and reminiscences from a cast reunion. Impressively, the bonds between them are still strong, despite the various paths their careers and lives have taken since the film was released. This segment includes behind-the-scenes footage taken on the day when Spielberg, getting into the spirit of the Hallowe'en celebrations, gamely turned up dressed as a woman, much to the amusement of his cast and crew. This is apparently an abridged version of a programme that aired on American TV earlier this year. Is there one single element more important to the film's success than John Williams' Oscar-winning score? There's footage from the film's original 1982 scoring sessions to break up the monotony of a simple talking-head shot. This section puts the composer in the spotlight for a change, for some insights into the score, and his long-lasting relationship with Spielberg. Has there been a closer bond between composer and director since Bernard Herrmann scored Marnie for Hitchcock? Bearing the unwieldy on-screen title of Live at the Shrine! John Williams and the world premiere of E.T. The Extra Terrestrial - The 20th Anniversary, this is the documentary that should have been on disc one, to precede the presentation of the optional John Williams audio track. Williams describes likens performing at the event to "a two-hour opera without intermission", and it does indeed seem to have been a remarkable feat, which required enormous preparation and no inconsiderable amount of stamina! The documentary shows that Williams performed an overture to the film at the event, which should also have been included on disc one. A comprehensive gallery of sketches, designs and photographs, broken down into six sections. Annoyingly, the viewer has no control over the speed of presentation (which is excessively lethargic), and there's no audio for these (which total about half an hour). It's interesting to wade through, but this would have been better presented in a more user-friendly way. It would have been an ideal feature to present on the discs DVD-Rom section, enabling viewers to browse the pictures at their own pace. Kids might get a tiny thrill out of this guide to the solar system, presented by E.T., but it's doubtful if anyone with an IQ in double figures will be spending more than a minute or two here. A [2'05] trailer for the 2002 re-issue, an advert for the Ubisoft E.T. computer game [1'30"] and an advert for the forthcoming Back to the Future trilogy DVD box set [1'34"]. There's a trailer for this feature, which advertises the exclusive material that will is being made available on Universal's website. I'll spare you the rant here, suffice to say that anything that is available on the website should have been put on the DVD. Presumably this is where the unedited deleted scenes will be found. Since Universal have chosen to use the gawdawful InterActive interface, it's likely that a lot of people won't be using this feature. So, what else is missing from the UK set that you can get on the Region 1 editions? Well, not an awful lot, frankly. There's a forty-minute documentary about Spielberg's career (Spielberg: A Look Back), a Spotlight On Location featurette which covers much the same ground as the Evolution and Creation featurette, the original theatrical trailer, production notes and that's about it. There's no commentary track on any of the available discs. Spielberg is adverse to contributing them, but it would have been fun to have had one from the cast members. So, which version is the best? Sadly, there's no one definitive package to opt for. Purists will probably want to get the two-disc Region 1 version (which is the only version that offers the 1982 version of the film (more or less) with a DTS soundtrack), or the forthcoming three-disc UK version. If you want the best selection of extras, bells and whistles, you'll need the Region 1 three-disc gift set (which also comes with a hardback book, a Senitype film cell and the soundtrack CD). If you're not too bothered about getting the full range of extras, or - heresy - having the original 1982 version of the film, then the UK set should be most acceptable.